OK; I had the dummy parts, but what now? 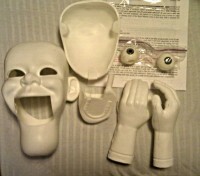 To those who haven’t given it a thought, it might seem like a simple task to make the dummy when you have the dummy parts ready (as shown in the picture). Well, it is not that simple, really. Making the head, hands and eyes is for sure a gigantic task, at least to me that has no sculpturing skills and haven’t done anything like it before. Getting a ready casted head, hands and eyes was to me the difference of making a dummy, or not making a dummy. Mike Brose at Puppets and Props has made the beautiful parts you can see at the picture. 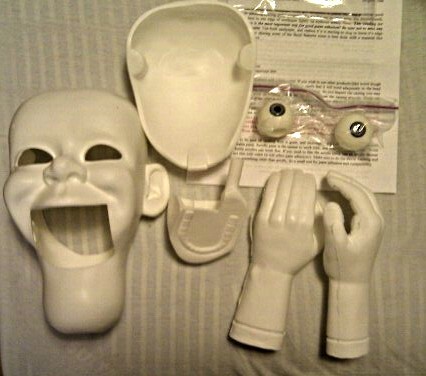 It comes with mechanics and an installation guide to assemble the jaw to the head, but apart from this, you are on your own. So what is it to make? You sit there with the eyes and want it to work somehow in the head. And should the dummy have blinkers or winkers? And what about raising eye brows? There are many things you can do, and a thousand ways to make it. And how should the hand controls be like? And what about painting, and hair, not to mention making a body? Before I could start with anything it was best to gather some information about making dummies. I have used two different sources. The most important one to me is a guide made by Al Stevens. This is available at Puppets and Props. It is free, but if it hadn’t been, I would have paid to read it. I have read it many times, and constantly checked it to solve small problems and re-read details. It covers all essential parts of figure building and is good enough to be the only source of information. As an additional source I bought the e-book Figure Making Can Be Fun?!? written by Mike Brose. It is a massive instructional book of 206 pages, and covers a broader area than Al Stevens guide. A large part of it is about modelling and casting of the head and hands, which was not of interrest for me in this project. It has also a more details on some subjects than Al Stevens’ guide.